This answer key is designed to be used with the Wordly Wise 3000, Book 8 4th Edition student book (not-included and sold-separately #7904). 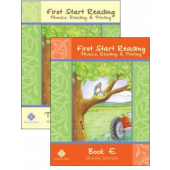 Answers for each lesson are included. Please note that these answers are already included in the "Teacher's Resource Guide" (also sold-separately #7905). 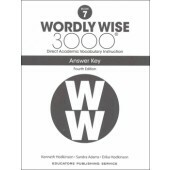 This answer key is designed to be used with the Wordly Wise 3000, Book 9 4th Edition student book (not-included and sold-separately #7907). Answers for each lesson are included. Please note that these answers are already included in the "Teacher's Resource Guide" (also sold-separately #7908). This answer key is designed to be used with the Wordly Wise 3000, Book 10 4th Edition student book (not-included and sold-separately #7911). Answers for each lesson are included. Please note that these answers are already included in the "Teacher's Resource Guide" (also sold-separately #7912). 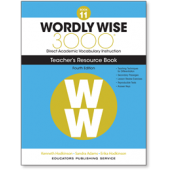 This answer key is designed to be used with the Wordly Wise 3000, Book 11 4th Edition student book (not-included and sold-separately #7914). Answers for each lesson are included. Please note that these answers are already included in the "Teacher's Resource Guide" (also sold-separately #7915). 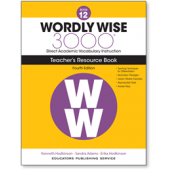 This answer key is designed to be used with the Wordly Wise 3000, Book 12 4th Edition student book (not-included and sold-separately #7917). Answers for each lesson are included. Please note that these answers are already included in the "Teacher's Resource Guide" (also sold-separately #7918). This answer key is designed to be used with the Wordly Wise 3000, Book 7 4th Edition student book (not-included and sold-separately #7901). Answers for each lesson are included. Please note that these answers are already included in the "Teacher's Resource Guide" (also sold-separately #7902). This answer key is designed to be used with the Wordly Wise 3000, Book 6 4th Edition student book (not-included and sold-separately #7898). Answers for each lesson are included. Please note that these answers are already included in the "Teacher's Resource Guide" (also sold-separately #7899). 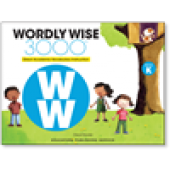 This answer key is designed to be used with the Wordly Wise 3000, Book 4 4th Edition student book (not-included and sold-separately #7892). Answers for each lesson are included. Please note that these answers are already included in the "Teacher's Resource Guide" (also sold-separately #7893). This answer key is designed to be used with the Wordly Wise 3000, Book 5 4th Edition student book (not-included and sold-separately #7895). Answers for each lesson are included. Please note that these answers are already included in the "Teacher's Resource Guide" (also sold-separately #7896). 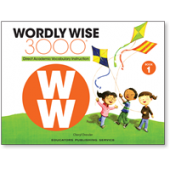 This answer key is designed to be used with the Wordly Wise 3000, Book 3 4th Edition student book (not-included and sold-separately #7889). Answers for each lesson are included. Please note that these answers are already included in the "Teacher's Resource Guide" (also sold-separately #7890).